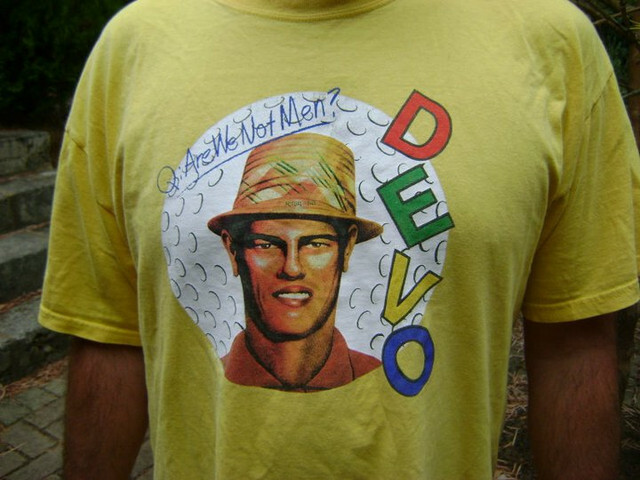 Devo! Born out of the Kent State massacre, they are one of the great politically subversive bands of all time. So good, I got the t-shirt! Heard their early stuff (pre this album)? It's wild! Buttered Beauties! Uglatto! Bottled up! A Plan for U! Fountain of Filth! Can U take it! Goo goo itch! "I used to be werewolf, but I'm alright NOOOOOOOOOOOOOOOOOOOOOOOW!" A mate put me onto these Italian yobs the other week. Anyway, True Blue Basher, this below a bit before your time ? Best Live Band they gave so much. So very Fortunate to see them a few times. All our Old school GC punk crew saw them last time in Brisbane 2013. Unreal! 1994 Gig. Band invited me to sing then another,another & so on until a full stage. This was the final song for the night. Imagine chorus getting louder each time. The reprise kicks in from 4:00 & normally runs to 7:00 (Live it went forever). Very few Bands waved Bouncers to share their stage with half the town. As I said simply the best live band. Shandy Dance all night is so much fun. factotum then asks if Sharpie vid is before my time?? I think it's lightyears ahead of everyone's time. Yes! Still today! That last Sharpie link is a wildly progressive soundbyte for 1974. factotum...Plain as day that band owns the Sonic Youth sound. If you had to push it you could maybe argue freak cutting edge Oz Punk classic. I did some searching for this amazing track & it just got way more amazing. Best Oz song by far & I just nominated it for world's best song category. How have I not heard this? I feel way to clean,need some concert muck real fast. I owe you big time factotum...To think trippers were treated to this in 1973 ? Give all of them feral muckrakers Orders of Australia for saving us a slice. Prog Rock meet your maker! I still can't fathom what I'm hearing...Is it legal? Everyone stop what your doing & do whatever the hell this is! My 5th time around! I reckon Ben might like a listen as in LP context. Give this one a chance,the beauty lies in the cacophony of perfect sound changes. Unusual to have random alternate rhythm changes that actually play off each other. Impossible to like a whole LP ? ...This one passes the test with flying colours. Very easy to leave this on the turntable. Years on it still sounds new. Covered by Bored! & the Cosmic Psychos. Check out who he produced if you've got a spare hour or two! From the Sunnyboys to X to Depression! Top Work factotum I got a good ear for sound & Two old fav's played in my head. Don't get me wrong Salutes were brief & honest & not a rip at all. (7:30) nod to Gritty Music Legend that for sure would have influenced them. (5:30) is a brief nod to renowned prog Italian outfit that pushed boundaries. Others won't hear it but I went straight for it...I knew where to look. These nods are obvious as few to this point had pushed the power envelope. There does seem a 3rd but it's buried in deeper...it will surface. That's the input now for output! The Clash seem to have borrowed the look as well. Sure looks like them. I've not had the time to reverse the process for which songs or not. No need! Whether you know or not U.S. Punk/Grunge have pillaged Oz for their sound. GC version I'm the last to know as I'm learning from you. GC Bands T-zer/Deadline/The Catholics/Cyanide/The Worms(Enzo) I knew! 1980's Punk kicked in. Usually no more than a handful of Sharpies. 1984 re: Above post/Family Tree is right by then last had grown hair out. I know because last sharpie 'Steve' flatted with me & In our band. 1980's Just repeating no real GC Sharpie Bands>Pub/ Punk/New Wave/Mods/Ska. Sharpie Chix actually hung around longer. 1970's Sharpie Chix had all the smokes at skating so they stood out. 1980's Sharpie Chix flatted with Punks then later Skins maybe more so. Chix were more common with rat tails for a few years past 1984. Note: Sharpies need for resident hairdressers/threads continued to all cult hovels. Some chix even had their own flats or shared with 2 blokes as common. Lots of Youth had bikes/scooters. Cars for Gigs & outings. Damn they cancelled the link. On 2 December, your Apple Music subscription will end. Stay with us to avoid losing all your playlists, settings and the music you’ve added to your library. Apple Support will tell you this will not happen ....... but it will and when it does they will refuse to restore it. If you are already subscribed to Apple Music, download some file ripping software and store all your music safely on a hard drive somewhere. Please let people know about this trap. Cheers BB. I don't have an apple music account. The wife and kids do. Nearly all the music on there has a CD we own behind it, saved on to a disk. The only necessity for apple music was that it was required for our Ipods. Generally speaking we buy our music and only save it to computer so we can then load it to a carrying device. I'll get my head round all this one day, but I don't need music all the time. Sometimes it's better to just be there, wherever you are. I am back to using CDs and loving it. Same, I'm over iPods only use for traveling one died and the others battery isn't what it use to be. Also over i tunes, i like Apple stuff but they make things too hard i can't remember why but i had issues swapping all my tunes over to new Mac so don't even use it anymore. Im back to buying CD's and also going to get a good record player and start building up my vinyl collection again. Steve Jobs was always a kunt. Surprise! Stu had better stand to attention for that! Wow. He's won the internet. A quiet Friday night, beer and red wine, chromecasting youtube for '70's music clips, I stumble onto this "scotch chocolate - Everyone's a winner" I had to look especially after a few bevies. Slightly disturbing but nowadays probably a normal Friday night at the pub in Scotland. Sorry I couldn't provide a link, I'm not savvy with linking..
China's Chang'e-4 probe set to explore 'dark' side of the moon. The probe has entered a planned orbit ahead of humanity's first-ever soft landing on the far side of the moon, the one that is never visible from Earth. Rumour has it that mission control have this playing in the background. Whilst us surfers have to get out in the ocean , expose ourselves to sharks , drowning and the ultimate downer of crowds ....you fuckers get to go nuts in your living rooms. You get to rip it up and ride the feeling anywhere there’s a few feet of space and maybe a power point if you’re getting real loose. This young chick is killing it. Maybe you’ve heard this before , maybe she’s already famous ? I just got introduced to her by a mate. I don’t know , I live in a cultural hole. It just makes it more special when I learn new stuff. Yes she is special. Plays ALL the instruments. Live I love the way she starts off then creates a loop then goes off on another tangent, with the guitar then brings it all together. Then she can sing and her lyrics are pointed, soft, tense, confronting.... telling her story, of surviving addiction and abuse at such a young age. Such maturity and humbleness is inspiring. Further to ditching MP3 and iTunes started topping up my vinyl collection with some favs. Just bought Screamfeeders "Rocks on Soul"
Just got onto an artist called Tropics. Real funky/jazzy loungey tunes with an amazing voice. His 2018 album Nocturnal Souls is great, put it on one evening over the weekend! Big fan of Primus/Les Claypool but i really like it when Sean Lennon sings on these tracks rather than Les, this has a very Beatles sound too it, but still unique. I saw The Beautiful Girls at Narrabeen last night. I have always enjoyed their music but this was next level. Stripped back to a three piece it was a power trio/reggae/dub jam to be reckoned with. Three great musicians feeding off each other. They are touring around, don't miss it! Nice BB! Wasn't aware they were touring. Saw Paul Dempsey for the first time last night at the Factory Theatre. Really enjoy his solo and Something for Kate stuff, but jeez, with just him and an acoustic guitar, he absolutely owned the stage. For such a simple setup the depth, sound and emotion he put out to the crowd was incredible. Some quirky funny moments and super relaxed. Can't believe I left it this long. Will definitely see him again. Thanks for that Craig. I will keep an eye out for a gig. People think the golden years of Australia music were back when the Oils were playing the Antler. For me right now is as good as it has ever been. Lots of great performers in small venues! Calexico were sublime at the Byron Theatre last night. Again! Saw 'em a few years ago, and last night was just as good as the last show. Is that you on the tambourine or the cow bell ? i like to think i'm the older guy with the moustache, frizzy hair and beads that is there to hit on the young hippy chicks. although on this evening, as any acid head can see, i'm only just keeping it together. Jazz virtuoso Wynton Marsalis and his 15-piece band will be playing various gigs around Australia in late Feb/early March. He'll be accompanied by the Melbourne, Sydney and West Australian symphony orchestras in the respective venues. Tickets ain't cheap but as they say, the quality will remain long after the price is forgotten. I saw his brother years ago. Gonna eat some Bez biscuits, Facto? Well, you never know, Stunet, but more like a pack of McVitie's digestives these days. Also there was no pill testing needed back then, kids. And a good little intro to the proto-punk garage world there, Stunet. I'd suggest those interested that don't know should check out the Nuggets compilations: Original Artyfacts from the First Psychedelic Era...and beyond. For stuff missing, well I'd suggest an Australian compilation of 60s garage punk called Ugly Things, featuring bands like the Missing Links, Adelaide's The Others (still going!? ), and the Purple Hearts featuring Lobby Loyde. Speaking of which, his later band the Coloured Balls is G.O.D!